To keep birds out of our shed from building nests above our R.V. I have squirrels on my RV trailer roof. Will try to scare them off. This guy is pretty sturdy once you add sand. It helped keep unwanted critters out of my garden. We bought this to scare birds away from our porch. It was getting pretty messy, so..... But it does not work, the birds would sit right beside it, didn't scare them at all. Not happy with that purchase. I am looking to find something to keep the birds off my dock. Husband wants because we have had trouble with birds at our lake house. I want to keep the birds away from my swim deck. looks like it will work in keeping the birds away from my deck. I would like to keep the birds out of our tree by the patio. To save my tomato plants from birds. We have problems with birds getting in trees over top of cars and pooping on them. We hope the owls will scare them away. This will work to keep birds from nesting in my car canape. I was looking for a owl to put in my son in laws garden to keep out the rabbits . Hoping this will help him!! My husband has a problem with birds nesting in his workshop. I am hoping that this will keep them out. Tired of birds sitting on the deck railing. 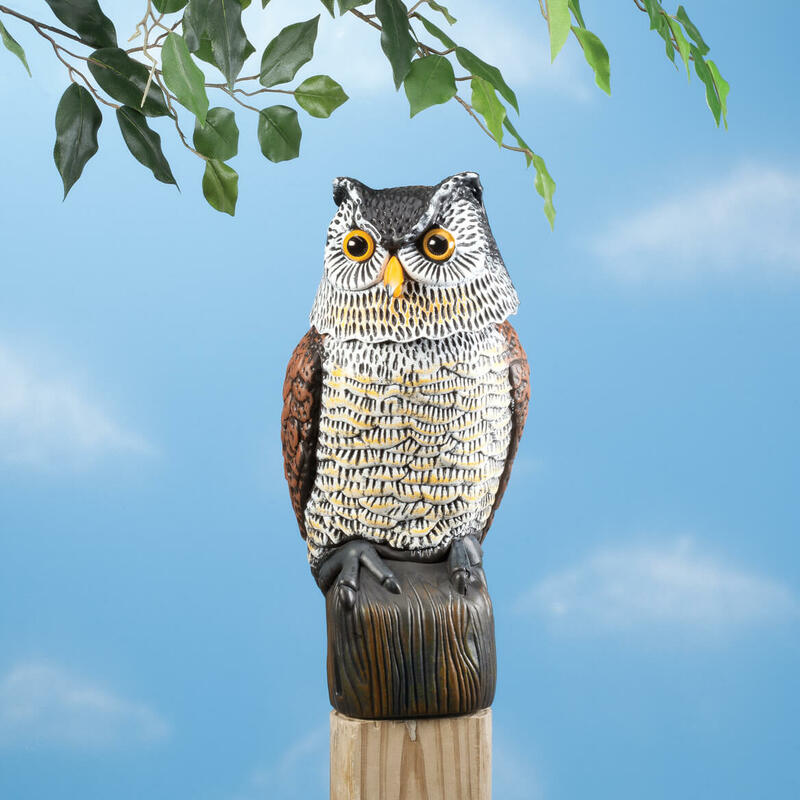 Thank goodness that the owl is cute to look at since it did not scare birds away. To scare all the birds that make a nest in my deck ceiling. because they keep bugs away from the door. Because our garden is being bothered by crows. I hope it works. To keep the woodpeckers away from the cedar shingles on our house. I am hoping to keep the squirrels from digging into our vegetable plants. I hope it works. I will put dirt or gravel in.. They keep some builds from building nest close to our house area. They serve a good purpose..
to protect vegetable garden--so far so good! 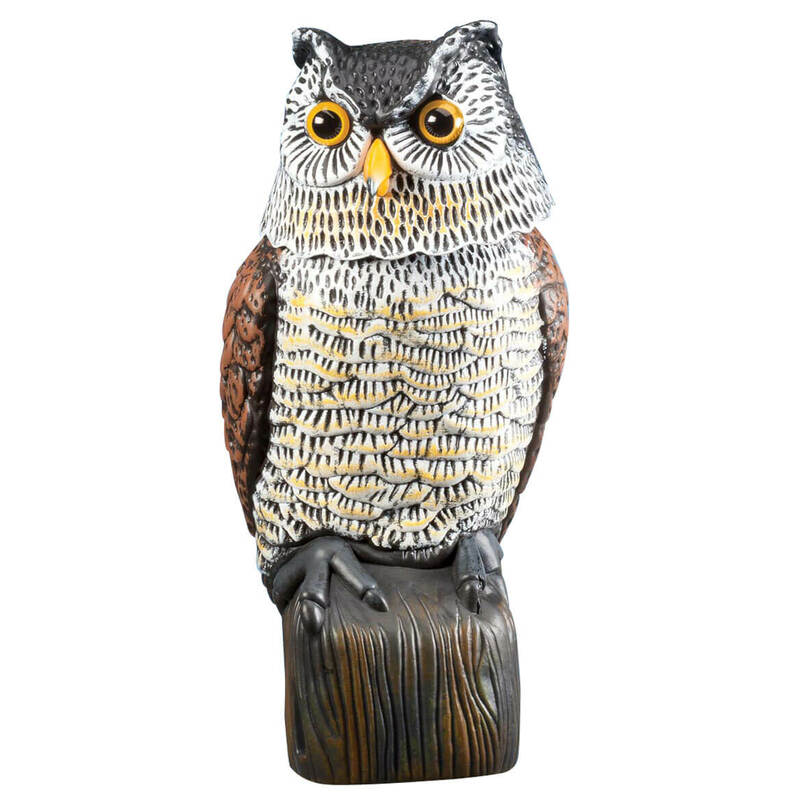 A friend told me that these owls worked for her because of the spring neck-the birds thought the owl was real. She hardly saw birds last summer around her home ! Keeps birds from using my deck railings as a toilet. To keep barn yard birds from making mud nest under my carport. BEST ANSWER: Do not know if it deters deer but it has worked on the birds that had been messing on our front and back porches. Thank you for your question. It will not deter deer. We hope this information will be of help to you.